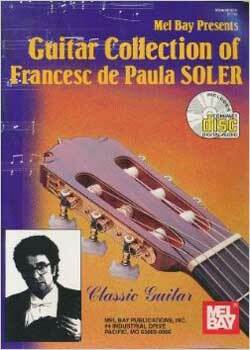 Guitar Collection of Francesc de Paula Soler PDF + Mp3 CD download. Classic guitar. Learn to play 13 classic compositions with famous Spanish guitarist Francesc de Paula Soler. Soler started his musical studies at the age of six, and later followed the tradition of Andres Segovia. His interpretations possess a great coloring which produces an extraordinary artistic feeling in the public. He is a virtuoso in the difficult skill of the string, a master of a great acoustic resources, and thus continues the great tradition of Andres Segovia. Regarding his wide international activity as a performer, the critics – calling him “Poet of the Guitar”- have hailed Soler as the most notable name in the new generation of Spanish guitarists. Download Guitar Collection of Francesc de Paula Soler PDF free and other books from our site. Only high quality PDF scans. Please write a review, it's important for our community. Amazing collection of classical pearls!